You can find more details about them (release date, pricing, page count) on the Bloomsbury site. International readers will be able to buy these new editions (including the new adventure, GARGOYLE HALL) on online retailers such as Amazon.co.uk or BookDepository.co.uk. All the books in the Araminta Spook series (plus the new one, Gargoyle Hall) are going to be rejacketed for new launch early next year! 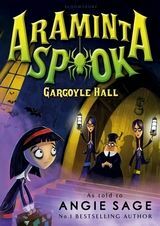 Great news – Bloomsbury in the UK are going to re-issue Araminta Spook at the beginning of next year and publish a new one too, so we will have six Araminta books out in the UK. Number six is called GARGOYLE HALL and I have just finished writing it. It was lovely to be back with Araminta, Wanda and the gang once again. What, you may wonder, is Gargoyle Hall? Well … it is the big, spooky house where Gargoyle Academy for Girls can be found. Yes, Araminta is being sent to boarding school! And she is not happy about it. Neither is Wanda. The books will have lovely new jackets by John Kelly who really gets Araminta and Wanda. He will be illustrating Gargoyle Hall too. Fantastic! As part of the countdown to FYRE, HarperCollins will be revealing the illustrations from FYRE before the book goes on sale on 4/16! Head over to the Septimus Heap Official Facebook Page to get all of them! Bookalicious just posted a new one: Queen Cerys. Check it out! Read the first 10 chapters of FYRE! You can now browse inside the hardcover edition of FYRE and read the first 10 chapters (that’s more than 150 pages!). Tell us in the comments what you think! Don’t forget: the book comes out next Tuesday! Also, don’t forget that now you can order the special edition of MAGYK (paperback, 4.99$, Katherine Tegen Books) that features the short story THE DARKE TOAD and two chapters from FYRE! Click here if you’re from the US or here if you’re from the UK. THE DARKE TOAD – out now! You can now download the Septimus Heap e-novella, THE DARKE TOAD, from online retailers! And that’s not all: the novella also features the first two chapters from FYRE, the seventh and final novel in the main series! Tell us in the comments what you think about this new book! Fans of Angie Sage’s New York Times bestselling fantasy series, Septimus Heap, will be delighted with this digital original addition to the series: The Darke Toad, a 96-page novella packed with action, humor, and magic that will have any child or fan of such fantasy books as Fablehaven or Harry Potter laughing and asking for more! DomDaniel returns in a hilarious escapade with the witches of the Port Witch Coven. In this tale that takes place between the stories told in Magyk and Flyte, the witches want DomDaniel’s powerful Darke Toad—and will go to ridiculous lengths to get their hands on it. But first, Simon Heap must get his master to the Port Witch Coven’s door, which may require a bit more Darke Magyk—and a much stronger stomach—than he bargained for. Is Simon up to the task? Meanwhile, ExtraOrdinary Wizard Marcia Overstrand has taken her young Apprentice, Septimus Heap, on a field trip to the Port. But what Marcia had hoped would be a fun yet educational outing quickly turns chaotic, for it slipped Marcia’s mind that tonight is Hallowseeth—the perfect night for Darke mischief to go unnoticed among the revelers. With Angie Sage’s characteristic humor, beloved characters, and Magykal setting, Septimus Heap: The Darke Toad is a must-read for every Septimus fan.